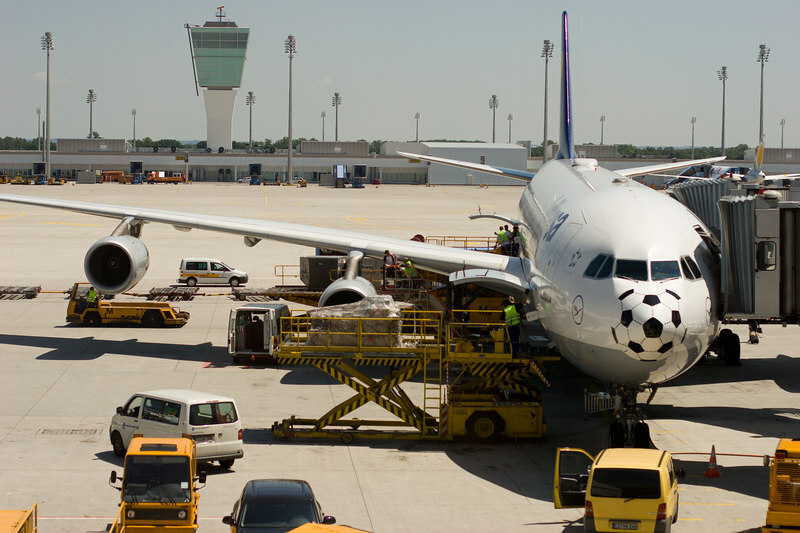 All of Lufthansa's jets seemed to have the specially decorated football nose - this one is at Munich airport where i had my stopover from Dulles to Hannover. 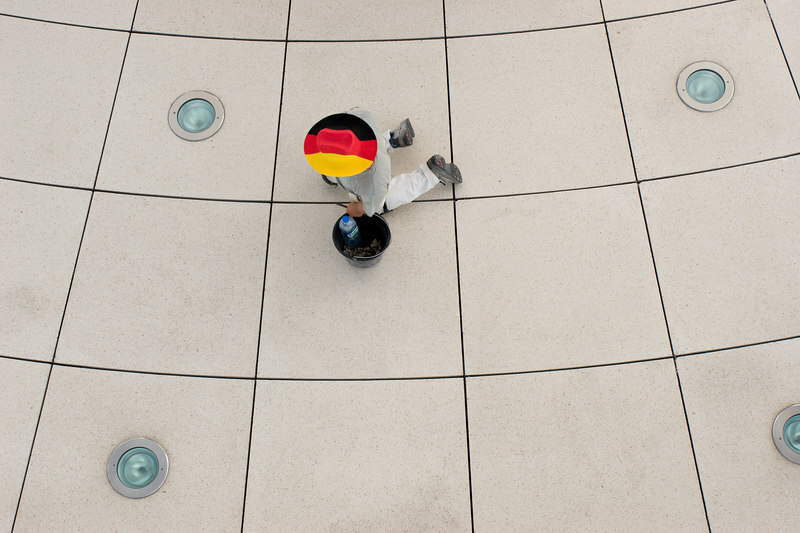 German worker doing maintenance of the floor inside the glass dome of the Bundestag. 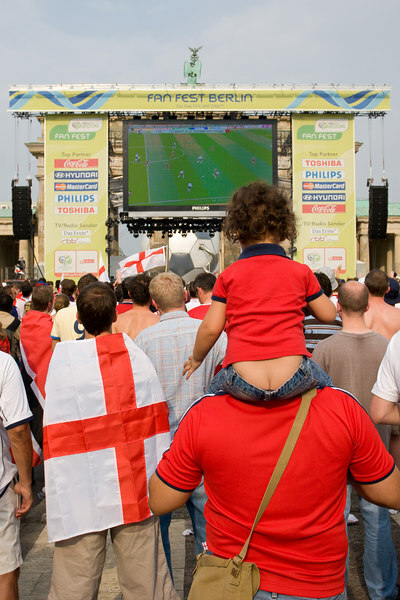 The England v. Trinidad and Tobago game is shown on the big screen at Berlin's Fan Mile, with the statue of Nike on the Brandenburg Gate just peeking out above. 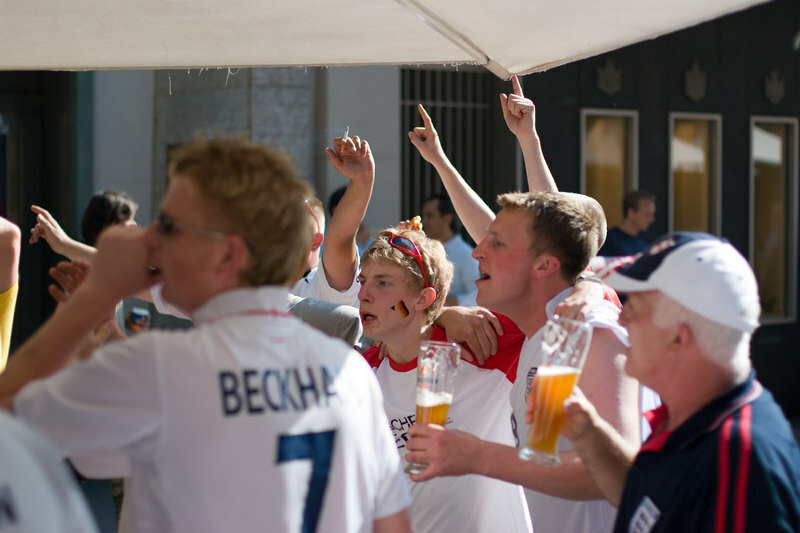 England fans' confidence starts to crack during the first half as Sven's men find it hard to break down a stubborn T&T defence. 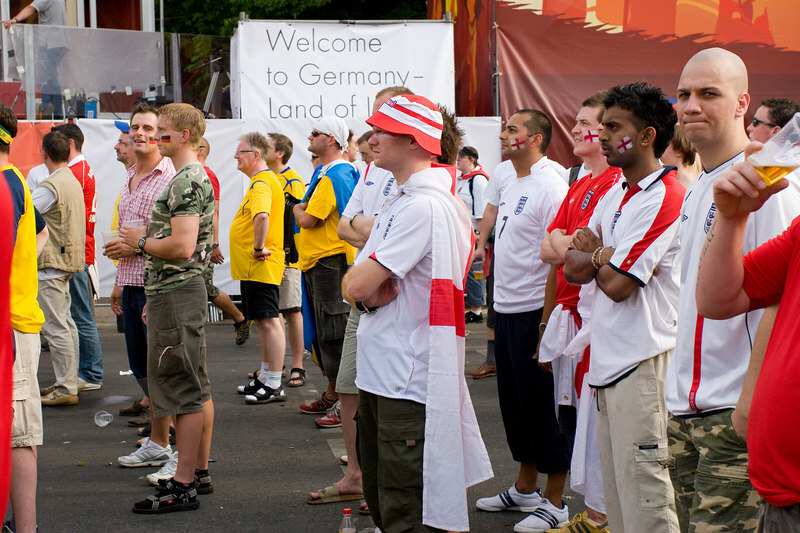 "Welcome to Germany - land of..."
England, Sweden and Germany fans watch the big screen at the Fan Mile in Berlin. 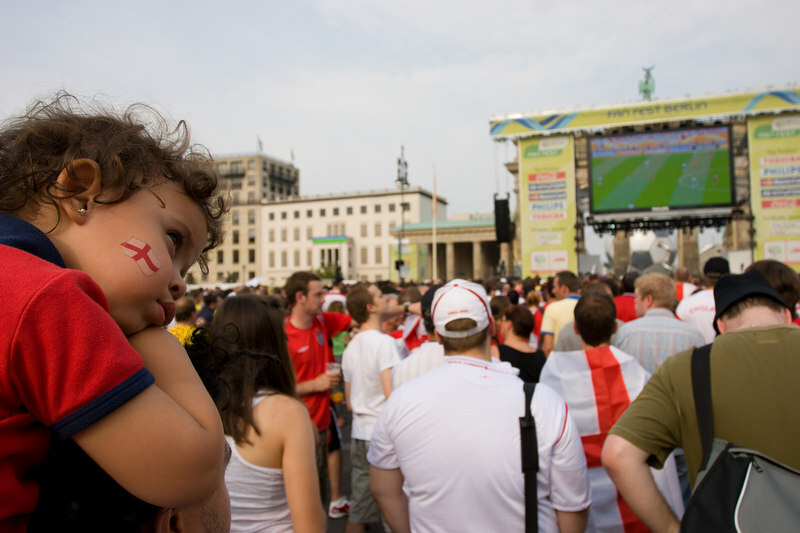 A young England fan can't bear to watch the England v. Trinidad and Tobago game on the big screen at Berlin's Fan Mile in front of the Brandenburg Gate. 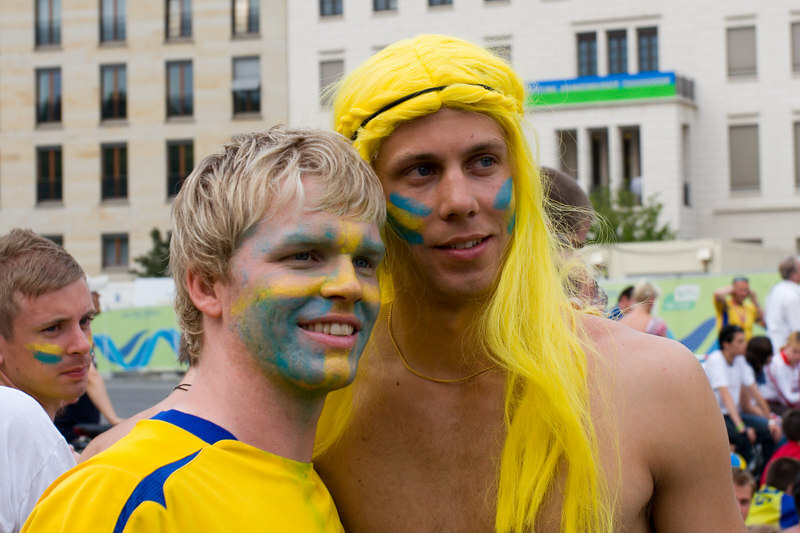 Sweden fans pose for a photo on the Fan Mile in Berlin. 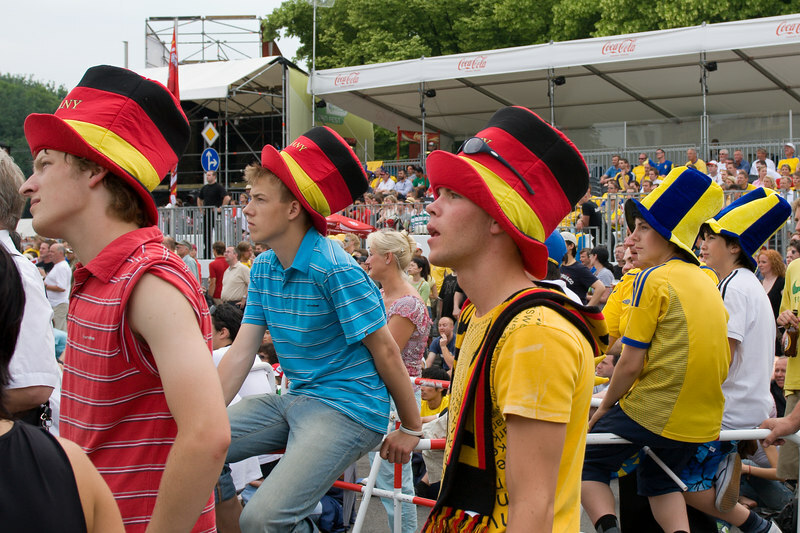 Germany and Sweden fans in their big hats, watching the England v. Trinidad & Tobago match at the Fan Mile in Berlin. 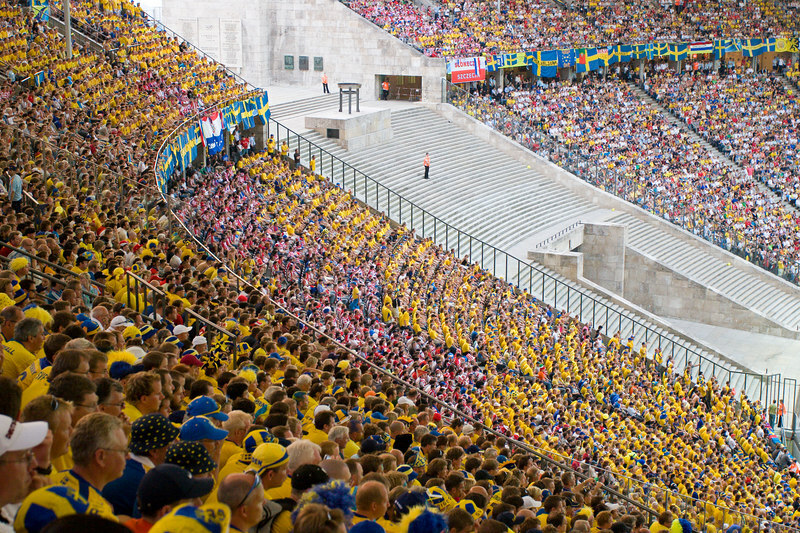 Sweden fans out-numbered Paraguay's by about 10 to 1 at their first-round match in Berlin's Olympiastadion. 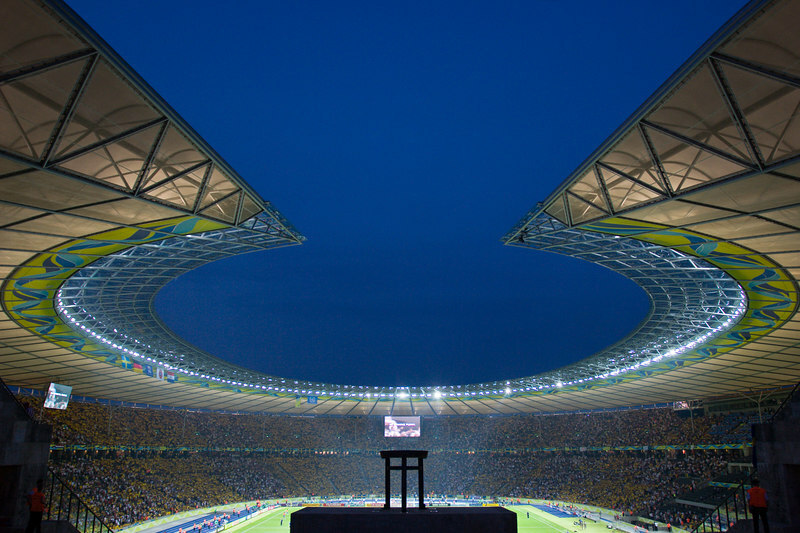 The famous Olympiastadion (the Olympic Stadium) in Berlin. 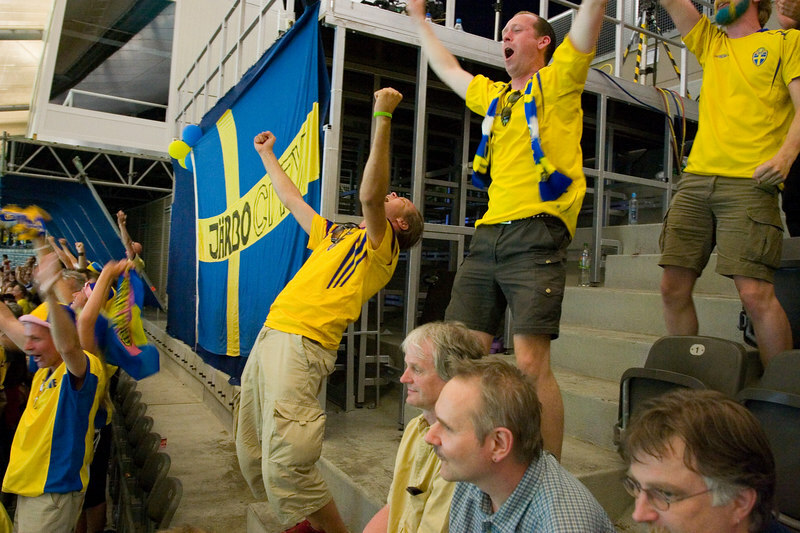 "Yesssssssssssss!!!" 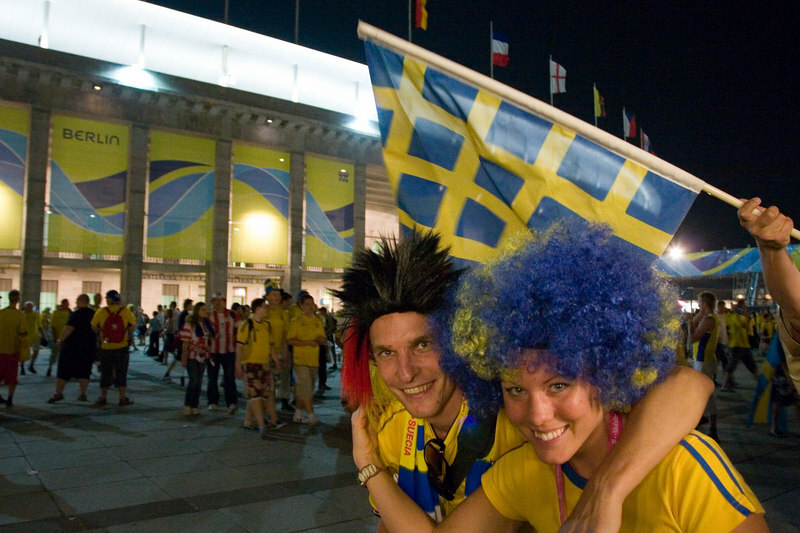 (Or the Swedish equivalent...) Sweden scores the only goal of the game in the 89th minute. 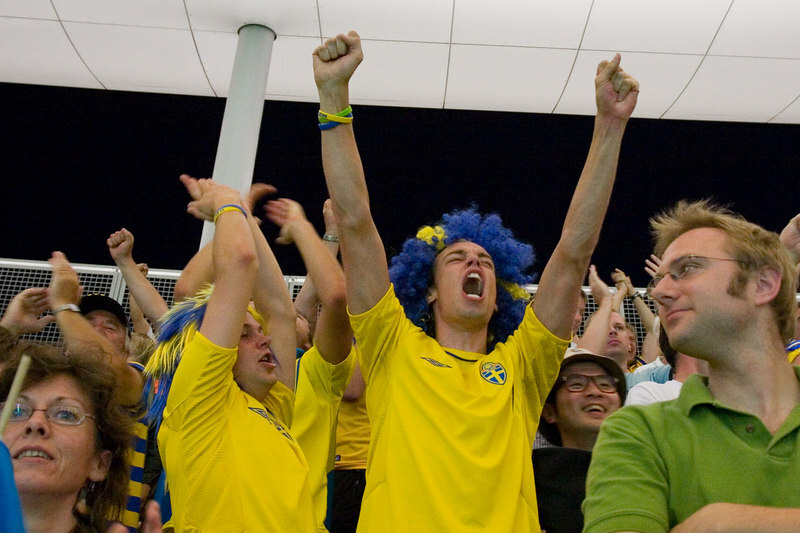 Sweden fans are over the moon. 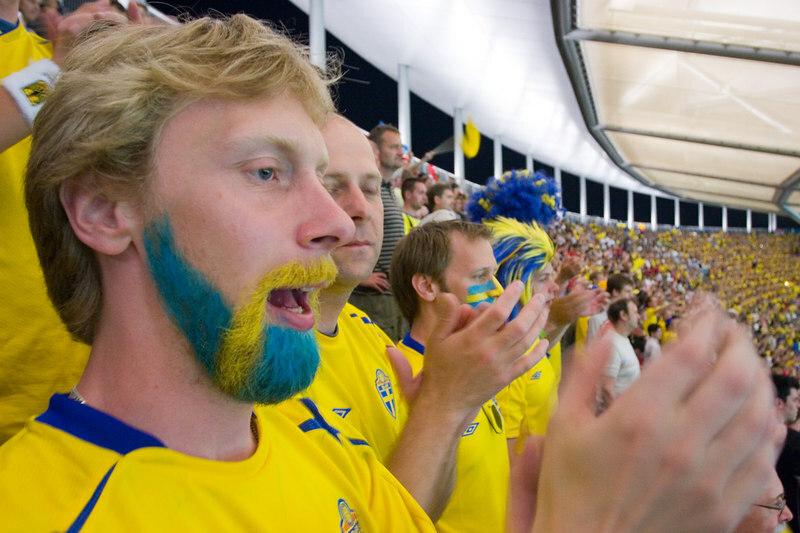 Happy Sweden fan with patriotic beard. 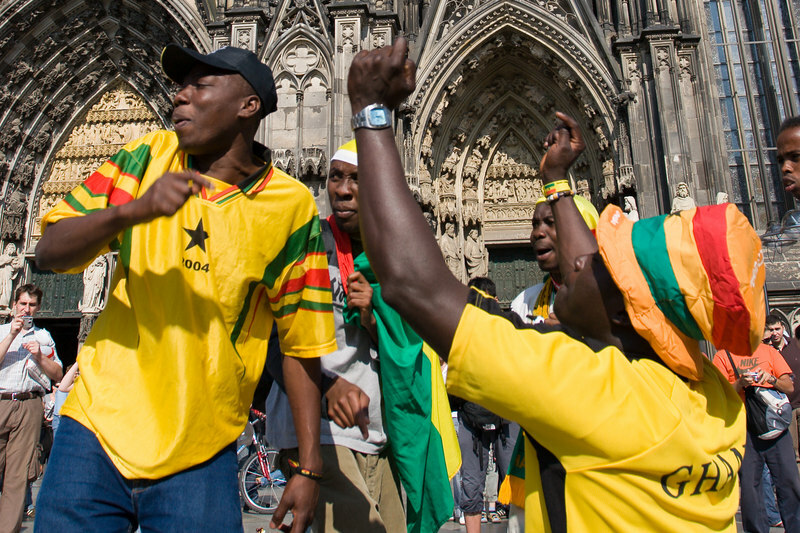 Ghana fans in front of the Dom (Cathedral) in Köln, anticipate victory a few hours before their game there with the Czech Republic. 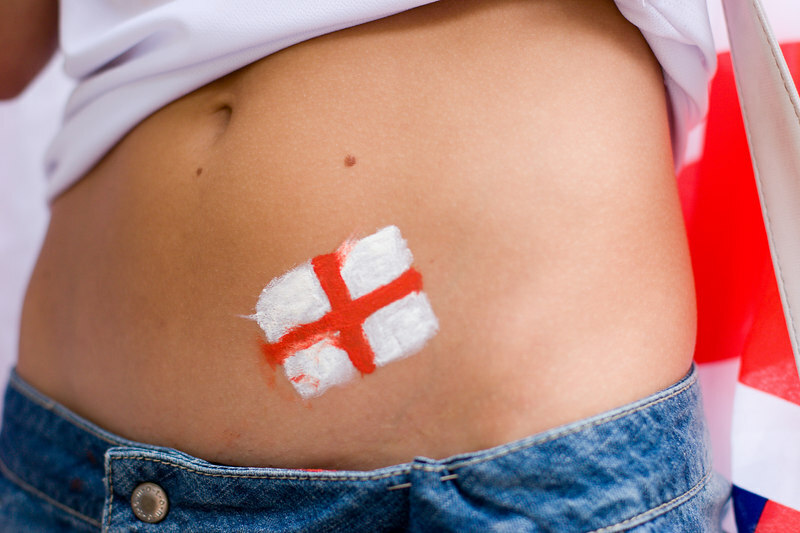 Ghana ended up winning 2-0. 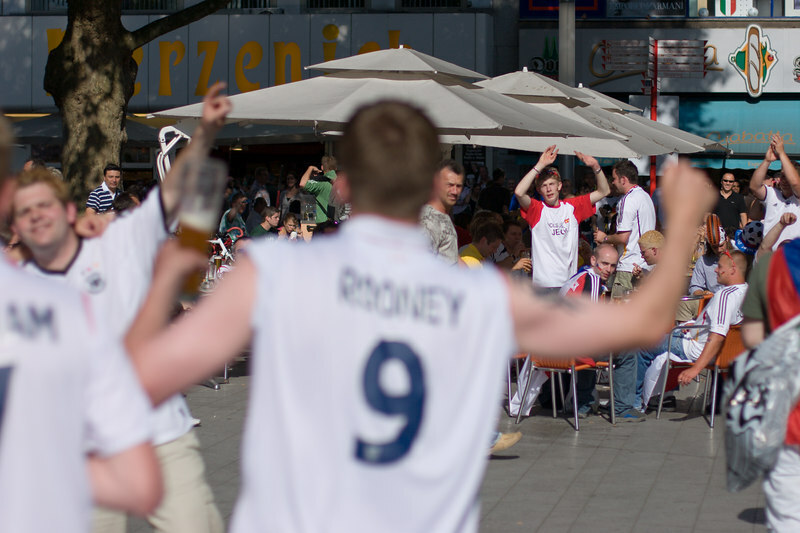 England fans drinking and singing patriotic songs at a nearby group of Germany fans in a square in Köln. 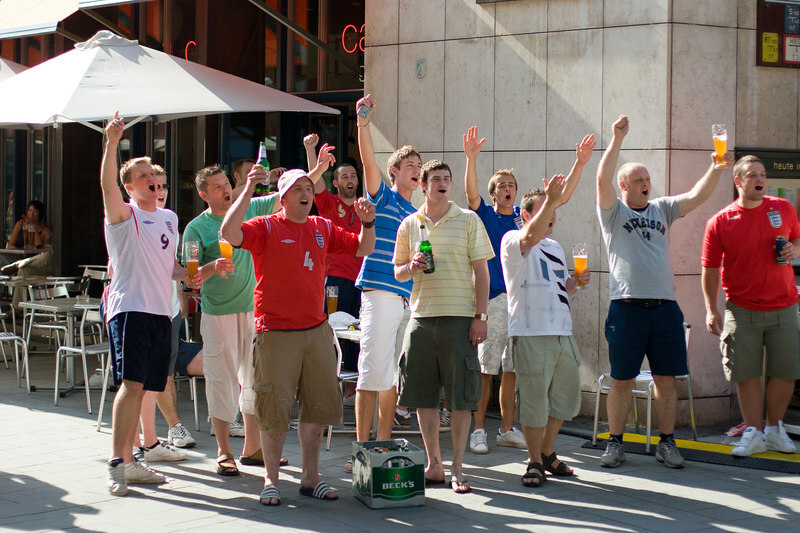 The aforementioned group of Germany fans singing patriotic songs back at the England fans. 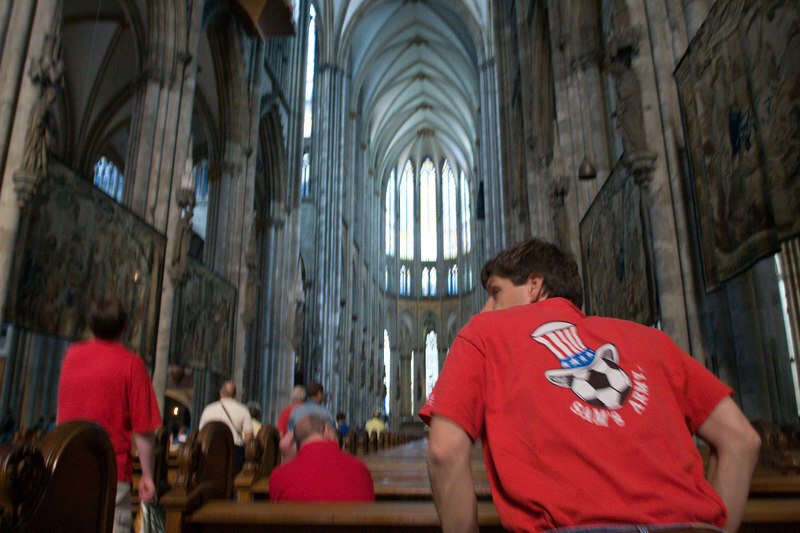 ...with nationalism put aside for several minutes as they continued singing in unison. 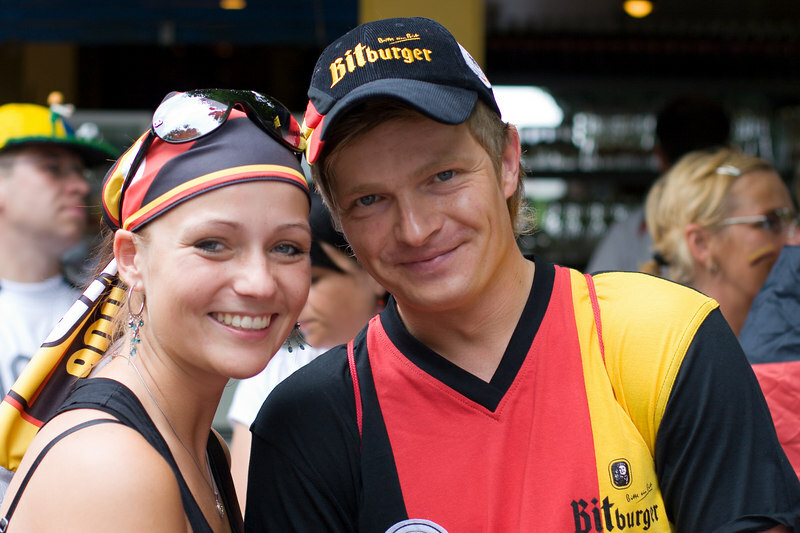 Oh, of course they also bonded over their love of beer. 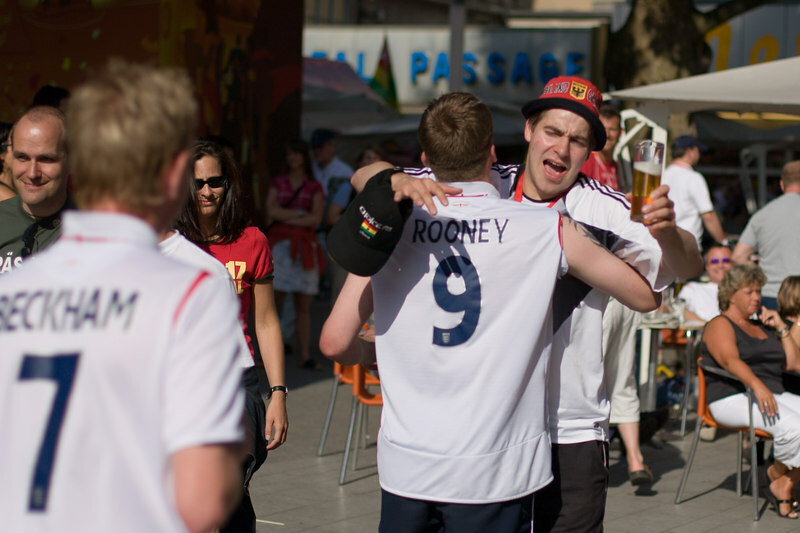 One of the group of England fans gets his photo taken with the security guard at the Cartier store on the square. 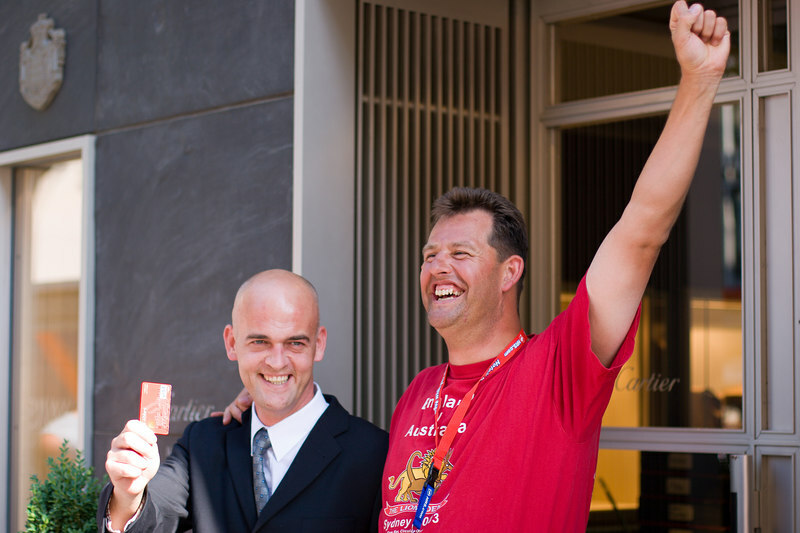 The guard, whom the England fans thought resembled famous Italian referee Pier Luigi Collina, is holding the England fan's red VISA credit card to mimic a referee's red card. 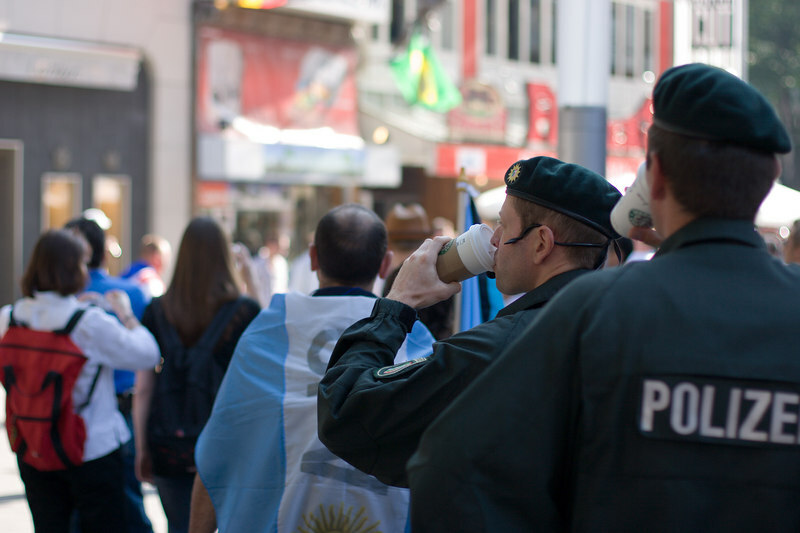 Köln police enjoy their Starbucks coffee while keeping an eye on the contingents of boisterous Germany and England fans. 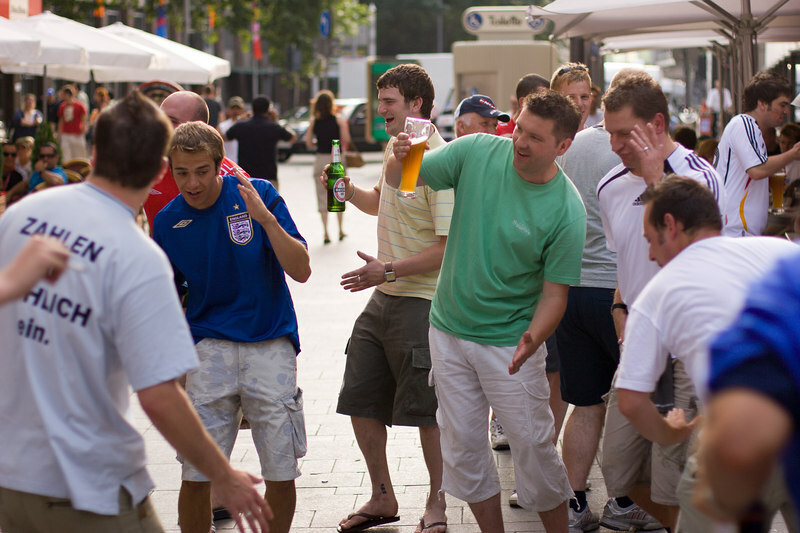 England fans break into an impromptu impression of the infamous Peter Crouch robo-dance celebration. 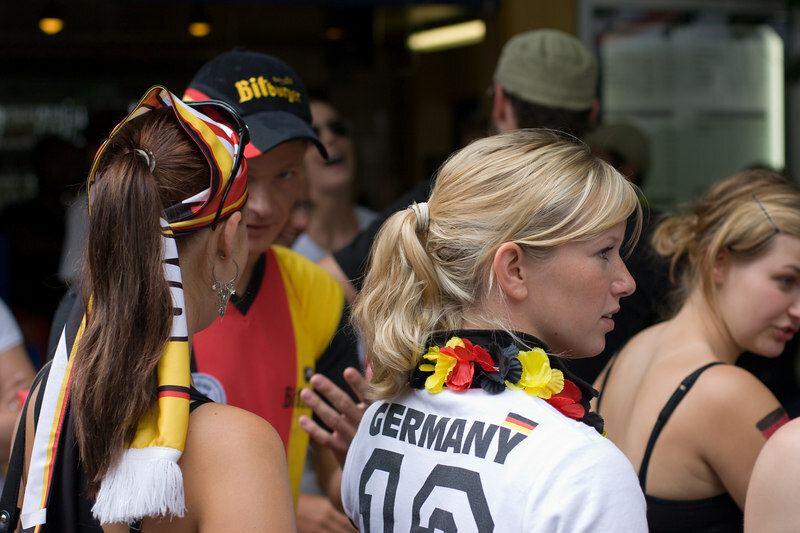 Erwin, Yvonne and Alexi catch the tram to central Köln to watch the USA Italy match at a bar. 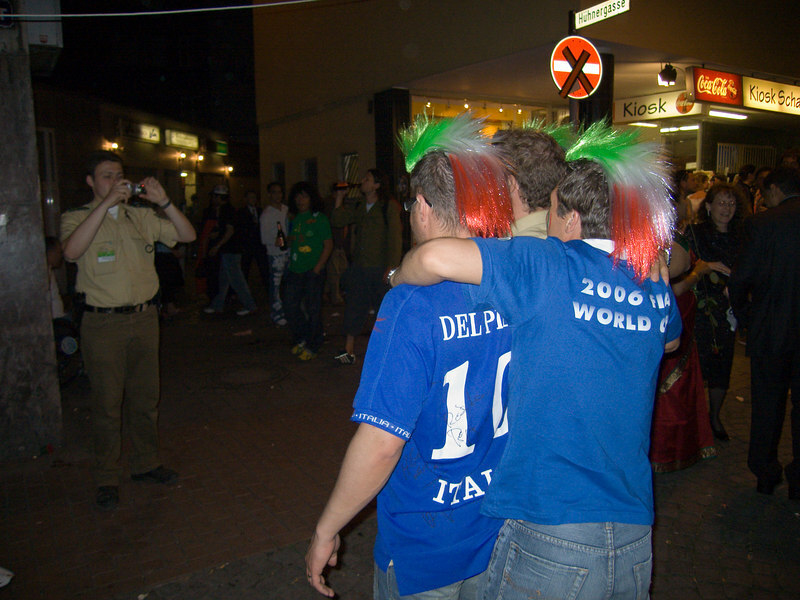 Italy fans have their photo taken by a Köln police officer after their 1-1 draw with the USA. 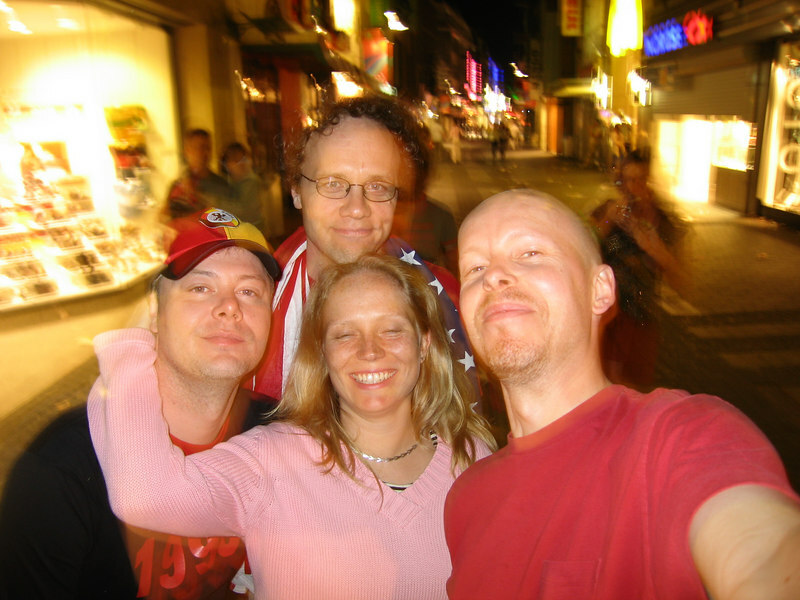 Erwin, Alexi, Yvonne and James on their way home from central Köln. 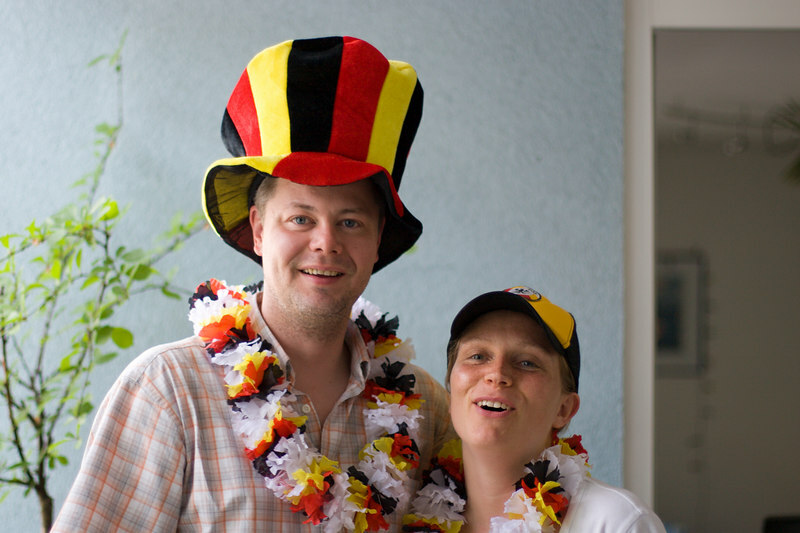 Erwin and Yvonne on the balcony of their apartment in Köln (full frame). 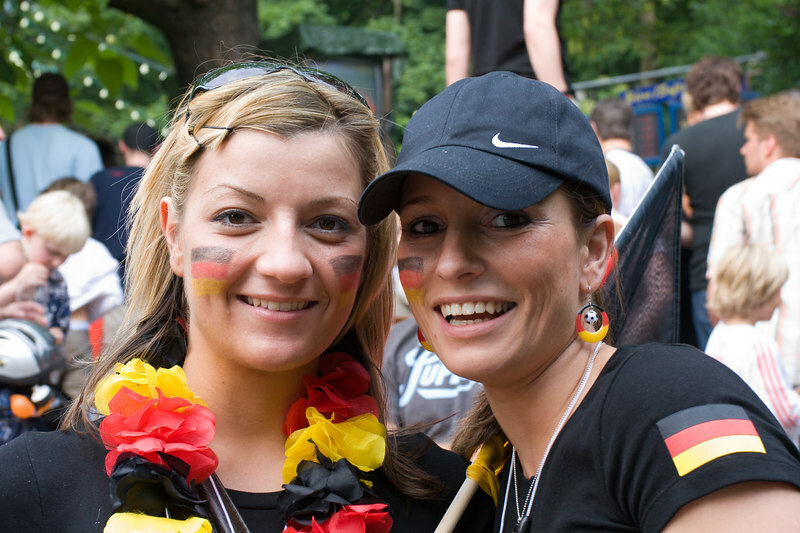 Germany fans gather in the Stadtgarten in Köln to watch television coverage of Germany vs. Ecuador, not far from Yvonne and Erwin's apartment in Ehrenfeld. 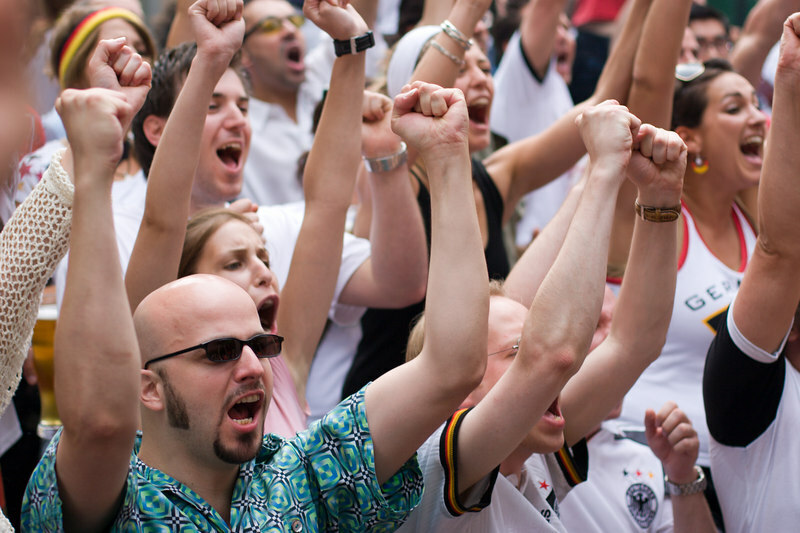 Germany fans are delighted as Klose opens the scoring against Ecuador with just four minutes gone. 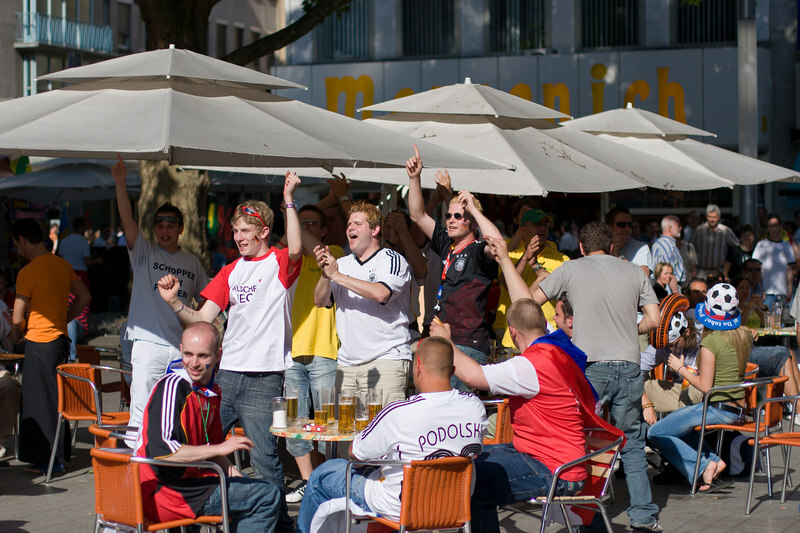 The fans cheer as Lukas Podolski makes it three nil to Germany against Ecuador. 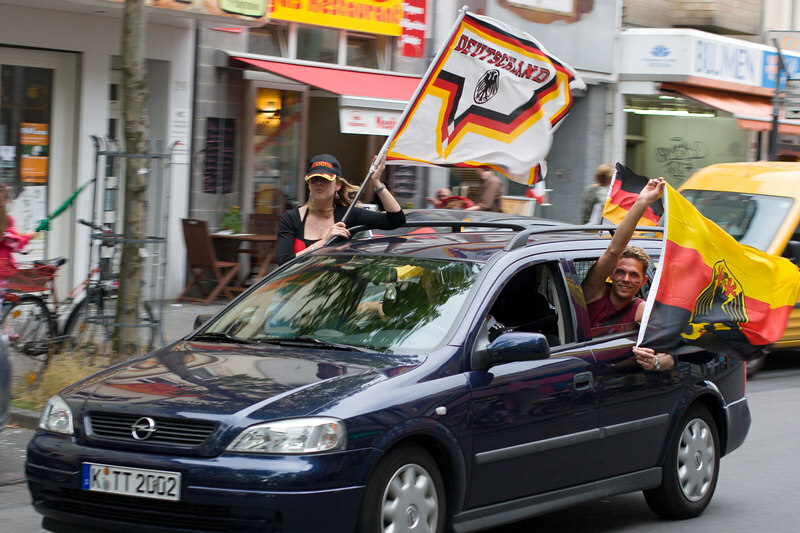 Germany fans celebrating on the streets of Köln. 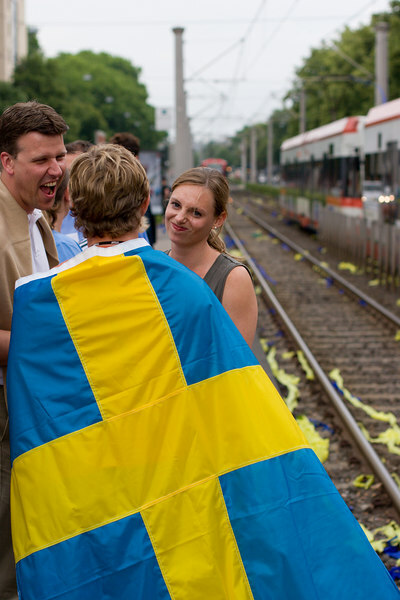 Sweden fan waiting for the tram to the stadium to see them take on England. 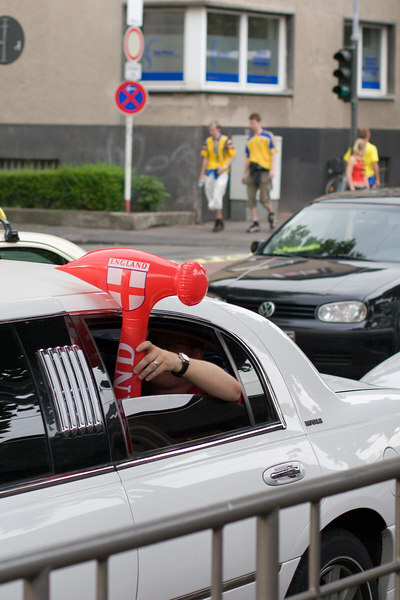 England fan with inflatable hammer heading to the Sweden game in a white limo. 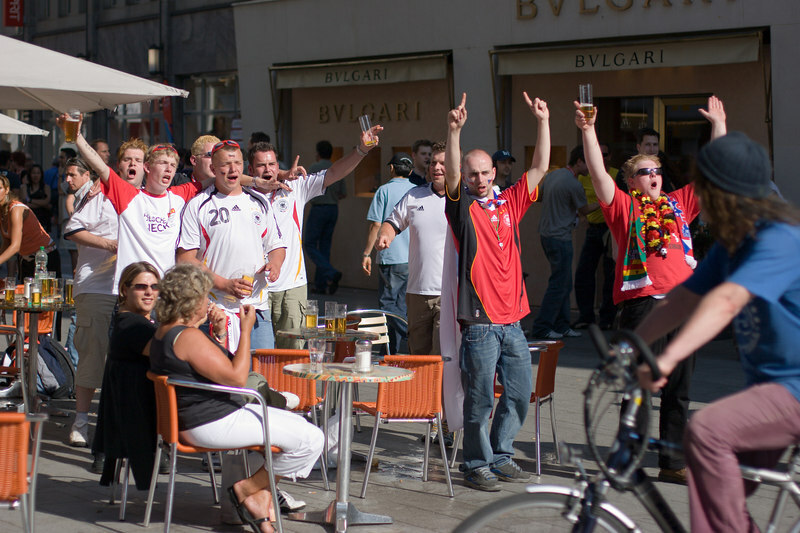 England fan, beer in hand, kissing a Köln police officer while his friend captures the moment on camera. 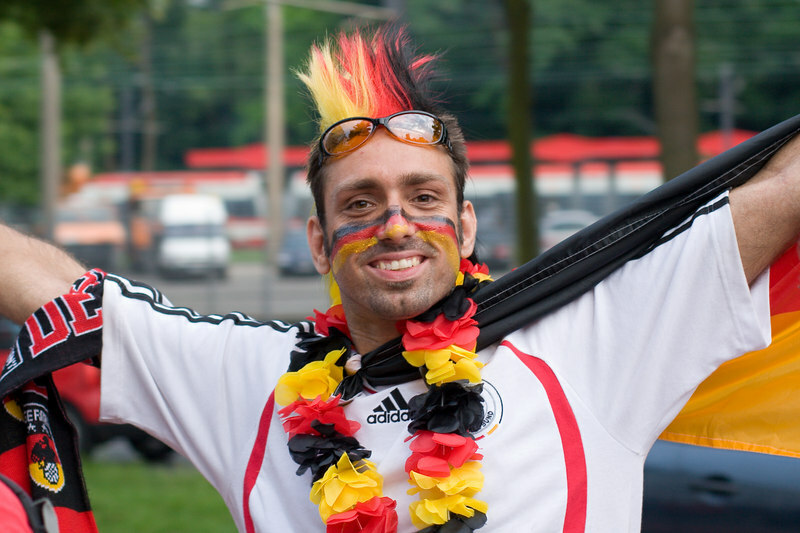 Chuffed Germany fan heading into Köln's stadium to watch England vs. Sweden. 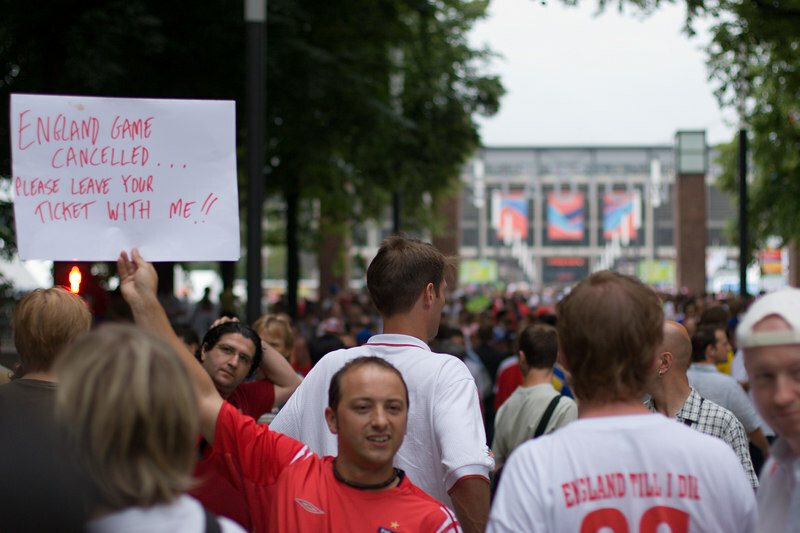 England fan outside the stadium in Köln before the game against Sweden. 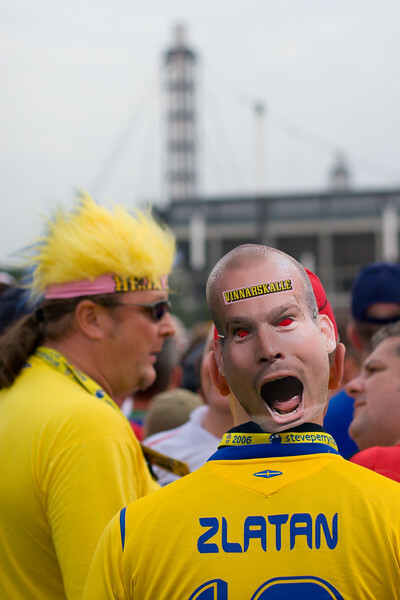 Sweden fans (one with a Freddie Ljunberg mask on the back of his head) outside Köln's stadium, before their match with England. 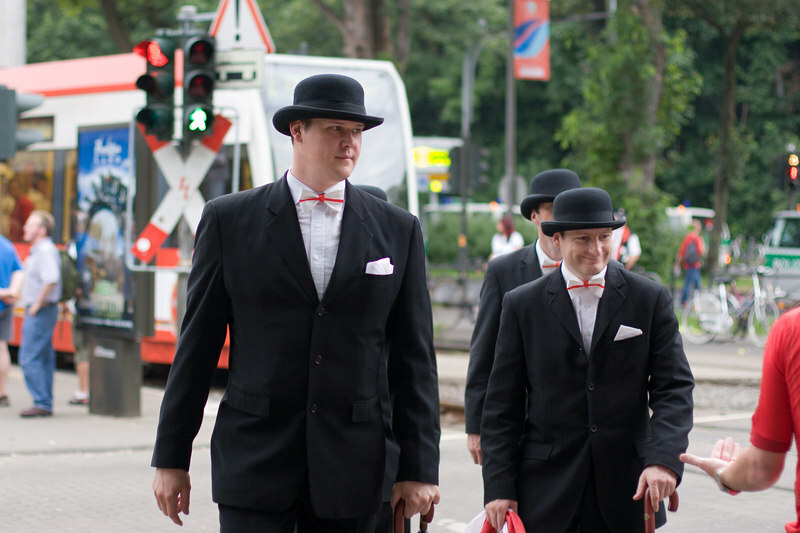 England fans in bowler hats and St. George's bowties arrive at the stadium by tram for the game with Sweden in Köln. 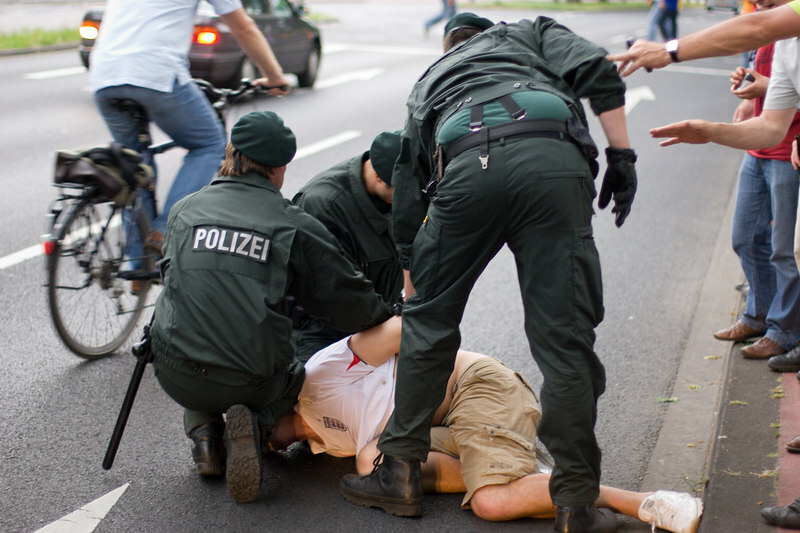 England fan being arrested by Köln police outside the stadium before the Sweden game. 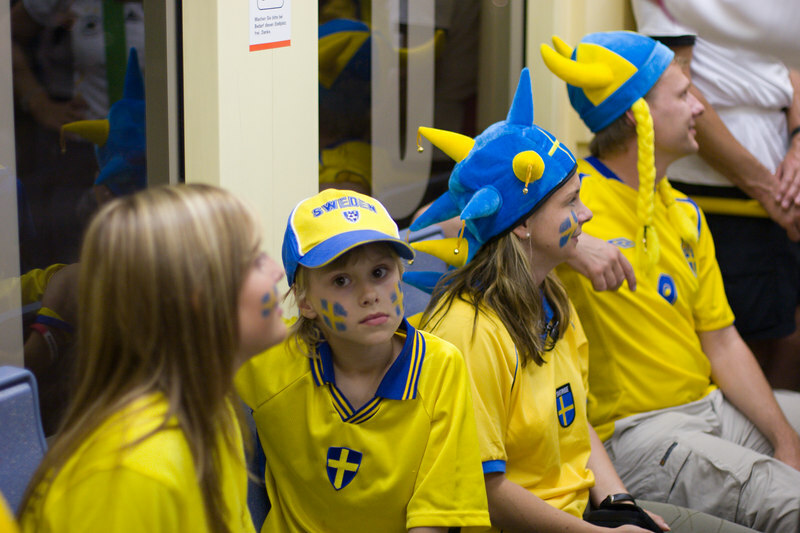 Swedish family on the tram from the stadium in Köln after Sweden's 2-2 draw with England. 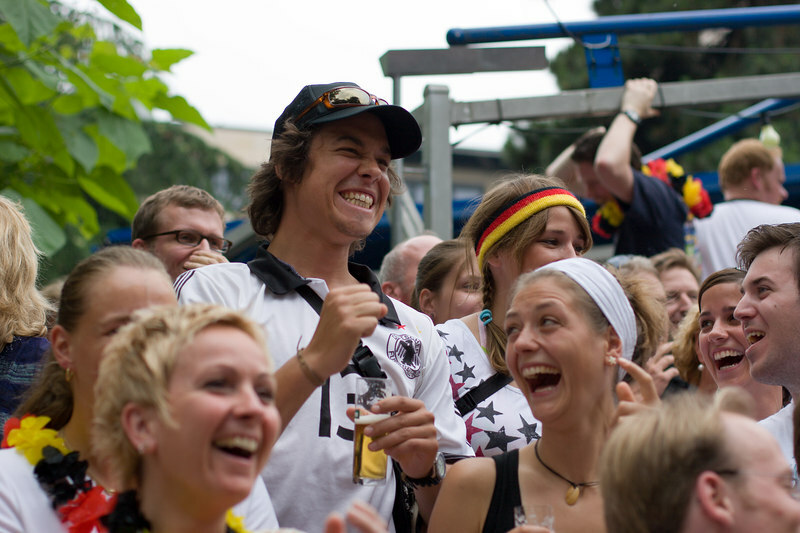 German couple on the tram from the stadium in Köln after Sweden's 2-2 draw with England. 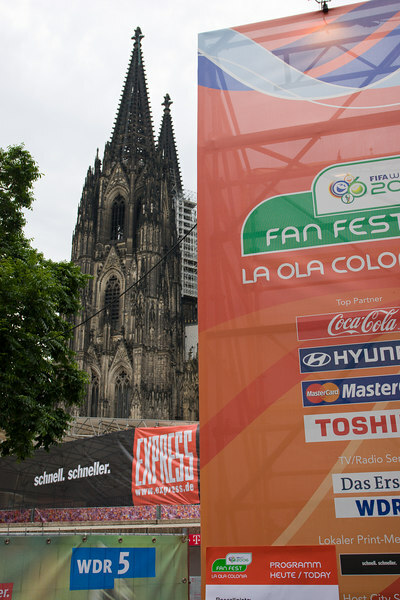 Old meets new - Fan fest area in Köln with the Dom (cathedral) behind. 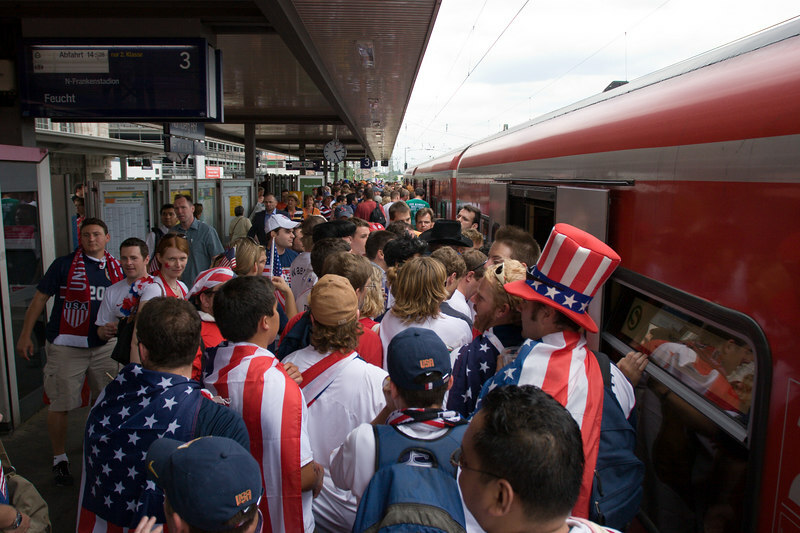 USA fans board the tram to the stadium in Nürnberg for the match with Ghana.